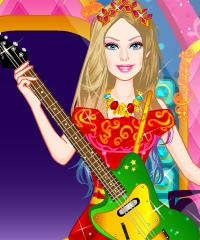 Barbie Popstar Princess is going to entertain her fans tonight on her sold out concert. Barbie will shine on stage with her music talent and her new fashionable outfits. Dress Barbie up in a trendy and stylish way.